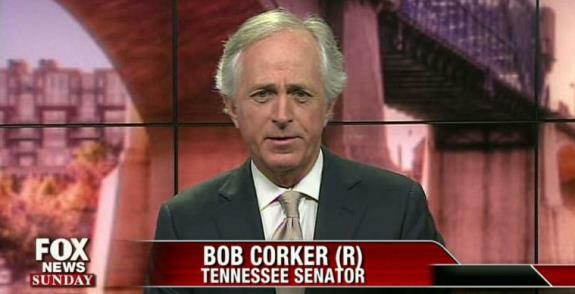 Back when establishment Republican Senator Robert Corker of Tennessee first proposed giving away the Senate’s constitutional power over treaties under the Article II, Section 2 “advice and consent” clause we called it treason (Republican Senator Bob Corker Is A Traitor) because it guaranteed that Obama would be able to end the congressional sanctions against Iran and put the radical Islamist regime on the fast track to a nuclear weapon. And Obama’s nuclear weapons treaty with Iran – with all of its secret annexes and side deals – did exactly that, but then it gets worse. Iran has now successfully test-fired a new precision-guided, long-range missile, according to CNN coverage of an Iranian state-run media report released Sunday. The Emad (Pillar) surface-to-surface missile, designed and built by Iranian experts, is the country's first long-range missile that can be precision-guided until it reaches its target, said Brig. Gen. Hossein Dehqan, Iran's defense minister according to CNN. Anthony Cordesman, a researcher at the Center for Strategic and International Studies, wrote in October last year that the Emad was a variant of Iran's existing Shahab-3 long-range missile, "but with a maneuvering reentry vehicle to improve system accuracy and complicate missile defense." Cordesman's report said Tehran has been steadily developing its missile technology, focusing in particular on improvements to guidance systems. Its existing missiles systems had "poor accuracy and uncertain reliability," he wrote, giving them limited military effectiveness. The improving missile arsenal gave Tehran "a longer range strike capability that its aging air force largely lacks," he wrote. Iran's air force, once the largest in the Gulf, degraded following the break with the West that occurred during the 1979 revolution, due to a lack of access to spare parts, maintenance and pilot training, according to Michael Elleman, a researcher at the International Institute for Strategic Studies, a UK-based think tank. Since then, with the help of North Korea, Tehran has focused on developing its missile capability, and now boasts the "largest and most diverse ballistic missile arsenal in the Middle East," says Elleman. Israel's stockpile was more capable, but smaller, as CNN reported and you can read for yourself through the links in the article. When Tehran announced in February last year that it had successfully test-fired a laser-guided surface-to-surface and air-to-surface missile and a long-range ballistic missile capable of carrying multiple warheads, CNN reminds us that the Pentagon spokesman at the time, Adm. John Kirby, described the missile program as "a dangerous threat to the region." Kirby noted that U.N. Security Council Resolution 1929 prohibits Iran from undertaking any activity related to ballistic missiles capable of delivering nuclear weapons, including launches using ballistic missile technology. Now our friend (and noted Iran analyst) Omri Ceren, has explained that not only is the latest Iranian missile test a violation of the UN sanctions, it is also a violation of U.S. law. Theory 1 says the two are largely separate, and this is what the Iranians say in times like now when they're violating the UNSCR: under this theory the JCPOA exists independently, and the UNSCR was just a way make U.N. resolutions line up with how the agreement legalized Iran's nuclear program. Theory 2 says the two are closely linked, and this is what the Iranians say when they brag about locking the U.S. into obligations: last April Iranian FM Zarif declared that the JCPOA would be binding on future American presidents because "there will be a resolution before the UN Security Council... which will be mandatory for all member states" [g]. Sometimes the Iranians embrace both positions in the same breath: last week a report from Iran's parliament assessed that UNSCR 2231 was "apparently... the JCPOA's only legal backing" but that Iran would not be bound by portions of the resolution limiting its military work [Persian report: h; translation via the Foundation for Defense of Democracy’s daily Iran Press Review: i] It's not clear why the Obama administration would allow Tehran to play this double-game, where the two are linked for the U.S. but not for the Iranians. That said, says Ceren, the legalistic "JCPOA vs. UNSCR" debate isn't going to be the focus of the next few days. It's a fairly damning indict of how badly American negotiators got rolled in Vienna, but the immediate question is much more straightforward: the Iranians have definitely advanced their ballistic missile program and have definitely violated a binding United Nations Security Council resolution in the process, and what is the Obama administration going to do about that? We predict that Obama and Senator Corker, who is Chairman of the Senate Foreign Relations Committee, will do nothing about Iran’s violation of UN nuclear missile sanctions. Senator Corker already betrayed American interests and the interests of our allies in the greater Middle East. From Israel, to Saudi Arabia, to India no nation now within the range of Iran’s fast growing missile technology is secure from the threat of a nuclear armed Islamist Iran. And make no mistake – the combination of Iran’s expansionist Islamism and nuclear weapons technology is an existential threat to western values and civilization. We don’t fear a nuclear armed United Kingdom or France, because they share our values, but we should fear, and do everything we can to prevent the emergence of a nuclear armed Iran precisely because the Islamic Republic of Iran wishes to impose upon the entire world a set of values totally inimical to ours – and to do so by force when they think they can win. Bob Corker betrayed constitutional principles when he rammed through the Corker – Cardin bill and the world will be a much more dangerous place for his inexplicable failure to grasp the existential threat a nuclear armed Islamic Republic of Iran poses to the United States. In that willful blindness he has in effect betrayed all peoples who share the values of freedom of conscience, freedom of religion and freedom of speech and who are now threatened by a nuclear-armed Islamic Republic of Iran. George Rasley is editor of Richard Viguerie's ConservativeHQ.com. A veteran of over 300 political campaigns, he served on the staff of Vice President Dan Quayle and as spokesman for now-Chairman of the House Armed Services Committee Mac Thornberry. He has served as a staffmember or consultant to some of America’s most recognized conservative political figures. He is a member of American MENSA and studied international relations at Worcester College, Oxford.